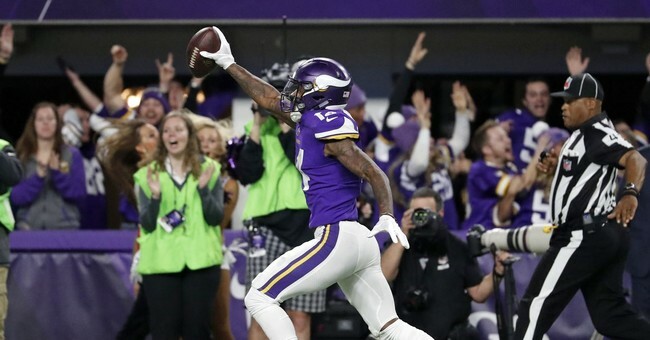 Because it's a Monday of a holiday weekend -- and because the final play of last night's game was as astonishing as any I can remember -- please enjoy the thrill of victory and agony of defeat, as described by the radio play-by-play broadcasters for the Minnesota Vikings and New Orleans Saints, respectively. For context, the Vikings blew a large first half lead to fall behind late in the game, risking another postseason choke job. But they rallied to kick a go-ahead field goal with a minute-and-a-half to play. The Saints marched down the field on the ensuing possession, however, re-taking the lead on a field goal of their own with just 25 seconds remaining. Out of timeouts, and with the ball in their own territory, it looked like Minnesota would need a long completion and a clock stoppage to even have a shot at answering back with the game's third field goal in the span of 90 seconds.